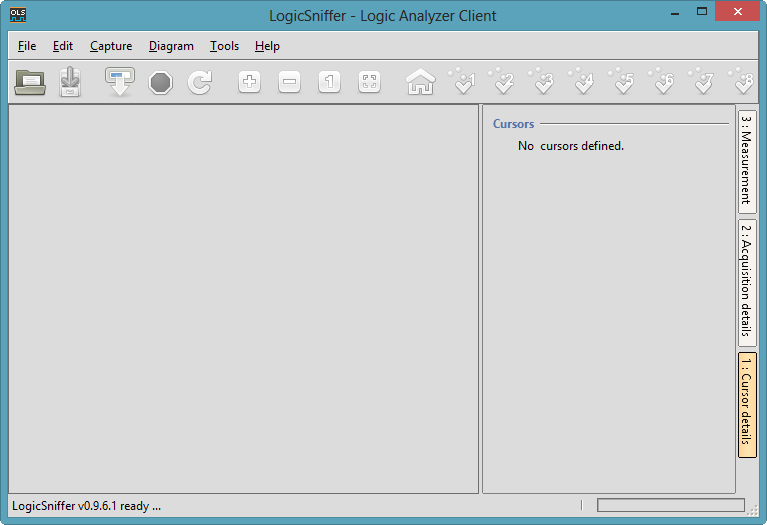 LogicSniffer is an OLS-client alternative software client for the Open Bench Logic Sniffer hardware produced by DangerousPrototypes. It is using the original SUMP protocol and an extension of it. The architecture is rather simple: on the Freedom board I have an application running which uses input pins to record the logic signals and stores it into a RAM buffer. The application communicates with the host over COM (Virtual COM, OpenSDA USB CDC in my case) with the SUMP protocol. On the host there is a client implemented in Java running which does all the presentation. Simple as that :-). A CodeWarrior for MCU10.3 project is available on GitHub. 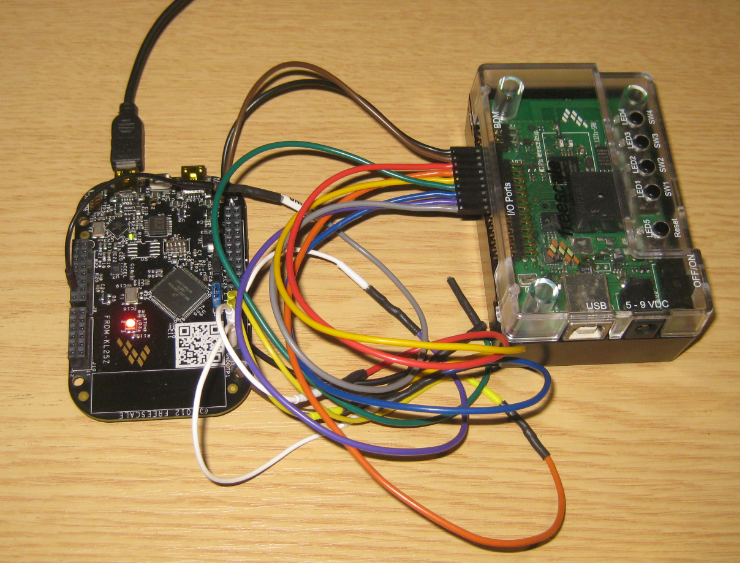 This project implements a Logic Analyzer probe. 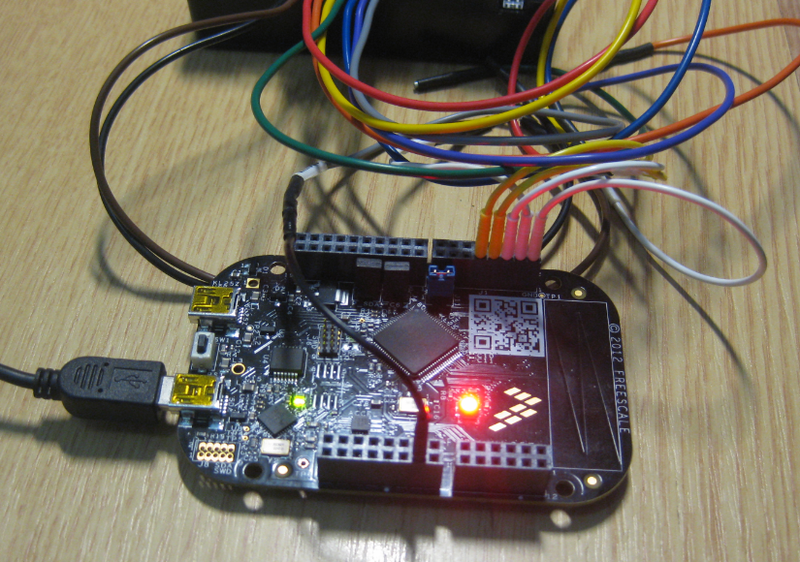 It is using the OpenSDA USB CDC port to communicate with the client. I have configured the SCI to communicate with 115200 baud. The Freedom board headers can be used to connect to the external signals. Be aware that GND needs to be connected, and that the FRDM board is 3.3V. So do *not* ❗ connect to higher voltages as this might destroy the board! Run the client with the ‘run.bat’ in the client software root folder. This opens a DOS shell and the Java client. ❗ It is important to select the correct device, as the configuration file defines the buffer size. If device/configuration does not match, then communication will fail. The application on the FRDM-KL25Z is a combination of C code and Processor Expert components. I would love to create a Processor Expert component for the firmware (buffer settings, sampling rate, etc) as any of these changes need a manual change of the configuration file. I could generate that configuration file from the Processor Expert component to make things easier. Additionally, I do not support triggers yet (that would be great!). And a more flexible probe pin assignments would be good too (I’m using now 8bit/pins of PTC port). 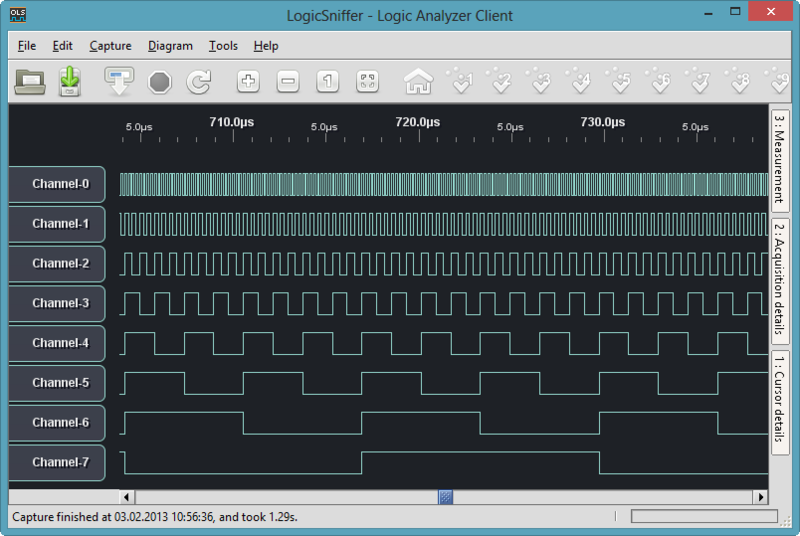 I still love my I my Saleae Logic Analyzer: the software and hardware is simply superb! But for hobby projects I have now an open source alternative based on the Freedom board :-). I cannot have the 50 MHz sampling as with the Saleae, but works well for many of my needs. This entry was posted in Boards, Debugging, Embedded, Kinetis, KL25Z Freedom Board, Processor Expert, Tips & Tricks and tagged codewarrior project, Debugging, freedom board, KL25Z Freedom Board, logic analyzer, software, technology, Tips&Tricks by Erich Styger. Bookmark the permalink. Thanks :-). I saw a similar thing using the TI Stellaris Launchpad, so I decided that it has to be possible with the Freedom board. this is a great Tool (and a big argument to convince people to invest in a small “professional” Logic Analyzer as soon as they see how useful this little toy can be)! Expecting this Project to work out of the box, i programmed my FreedomBoard immediately and the Firmware started (LEDR blinking). The Installation of OLS was also quick done, BUT the FreedomBoard can not be connected to OLS. I tried several free USB Ports, the Debugger finds the OpenSDA device, but the OLS Software does not. My USBDeviceViewer shows the SDA Device on the selected Port. By the way, after importing all FreedomBoard Examples from GitHub, the LED Komponents of several Projects have corrupted BitIO Pin Definitions, and can not be compiled ( i.e. UsbCDC). (FatFS has a locked GenericI2C component). OpenSDA (USB CDC) can sometimes tricky. Closing the COM port, unplugging, re-plugging and then re-opening the COM port usually helps. Otherwise the Windows COM/USB port might be stuck. If you press the ‘Show Device Metadata’ button, it will communicate to the board. Set a breakpoint on line 120 in Logic.c (cmd = GetChar();): it should stop there. I check the GitHug examples. Are you as well the components from GitHub? The examples are aligned to these components. But I will cross-check on my side. thanks for the speedy reply ….. Sorry, I did not install the new components because i did not find any *.PEupd files 😉 Now i know how to install the Components directly, and guess … they are working as expected! So your Git repository is fine. 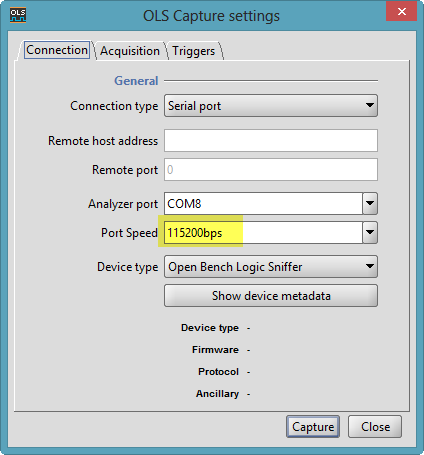 But i can not connect to the OLS (even not with the Debugger). I expect the Problem on my PC side, because there are sometimes Problems with FTDI and SiLabs VCOM drivers on my System. Up to now all other Devices (OpenSDA, other Debugger and Programmer Devices from different Hardwaresuppliers) are working fine. So i think you should not spend more time on this issue until other testers will find similar Problems. I keep you up to date when the Problem is solved. ok, good to hear that there is progress. As for the connectivity: I’m using the OpenSDA SCI in my example, but you could change it to any other (real) serial port (if you have one), of course with the correct level shifter. I know that USB CDC sometimes can be a pain…. found that the UART used for the Project Example was not UART1 (as is in use for the SDA_CDC USB Port), but UART0. OLS works fine (out of box) if i connect an UART2USB converter like an SiLabs 2102 Breakoutboard to PTA1 and PTA2 of the Freedom Board. Strange. On my board, the UART0 is connected to the K20 (OpenSDA), and works for me as as USB CDC. With this I can communicate and debug using the same USB cable. Do you have a different board? Sorry, i identified the labels on the circuit drawing UART1_Rx_TgtMcu not correctly as going TO the K25. I think i better stop for today with fiddling around with USB issues. Removing all USB Drivers from my PC, and reinstalling only the OpenSDA drivers did not change the situation. Debugging is possible, but no communication with the Example applikation. Using this very small and cheap SiLabs Adapter with fresh installed VCOM drivers at PTA1/PTA2 Pins solved this Problem for today. as i expected, the Communication to the Freedom OpenSDA CDC Driver was blocked from an Virtual FTDI Driver. This Device was not connected for a long time, but all Drivers ever installed will be loaded to Memory, even if not actually active. But they are not visible inside the Hardwaremanager — until you follow the Microsoft Knowledgebase Item # http://support.microsoft.com/kb/315539/en! After solving this issue, ALL LOADED Drivers are visible and you will be able to deinstall them comletely. So it seems that not the USB CDC is the pain …..
Nice. What was the top sampling frequency achieved? I just got an Open Logic Sniffer board to debug a stupid little bug on my FRDM-KL05 board. I mostly used it in the few hundreds KHz sampling area, not tweakening things for performance. I have not tried it out to which level it can go. I used it so far to store 8bits per sample. I think limiting the number of bits should give some longer smaplings and as well potentially increase the performance. b) you need to generate code first. Select the .pe file and use the context menu to generate code. Follow the steps from your link, I have imported all two parts of *.PEup file from processor expert menu and then do step b). But the errors have not fixed yet. Do I need other steps, like import components which just installed from step a) to my project? 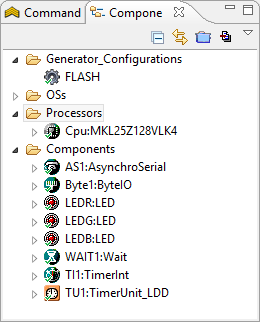 The other thing could be: because you had not the needed components installed, Processor Expert could have assigned the LED_DSC components which are not the ones needed. Can you re-load the original project? Otherwise post a screenshot what you see? Thank for your enthusiastic reply. I have it runs on the board now. 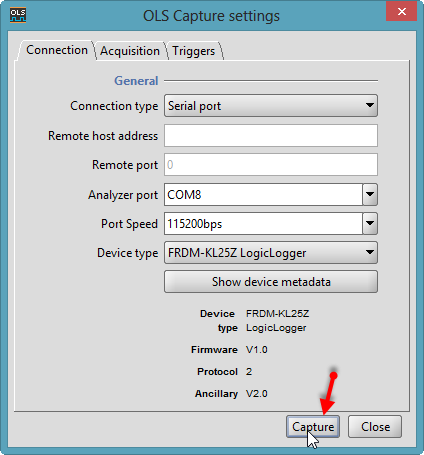 But have a new problem when connect the board with OLS is that I cannot select device type in OLS capture setting window as your picture show “FRDM-KL25-Logiclogger”, because it isn’t in list of device type. When I press capture, there is nothing show in screen. Yes, I have already read it and done that step. But It not work. I just built project from codewarrior, and program it to my board, my board run with rbg led red blink. after that I put the .cfg file to plugin folder of OLS, and then run .bat file. 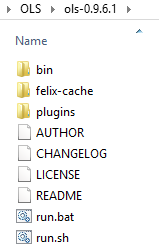 Once you have that .cfg file in the plugin folder of the OLS, it should show up. Are you sure you have rescanned the plugins? Do I need wire my board exactly as you did? Yes, this time I even carefully restart my PC, but it still not work. My board have not wire any probe, I just plug usb cable and run it. Is it ok? I think it is. You need to connect the board on the OpenSDA USB port. That way the KL25Z microprocessor can have a serial connection to the host using a virtual COM port. No. All what you need is a serial connection from the FRDM-KL25Z to your host. If OLS correctly recognizes the .cfg file, then it should show up under ‘Device type’. If not, then it has not been recognized. As for the acutal data capture: it needs a serial (virtual COM) connection to the board. In my screenshots I show COM8. But on your system it is very likely another COM port. Check your device manager which COM port is the correct one. Thank for your time to help me. ahh, that would explain it. I’m still on the old version. Not sure why it does not work on the new one. 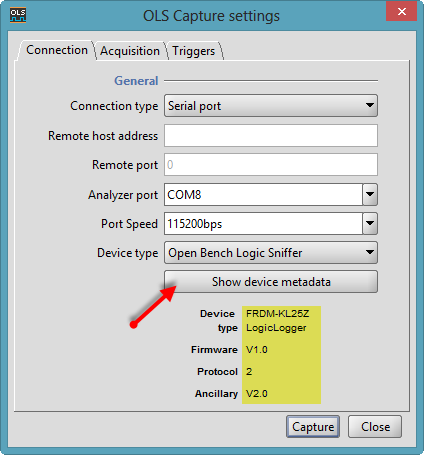 I compare the ols.profile-ols.cfg with the ols.profile-FRDM-KL25ZLogicLogger.cfg in ols-0.9.7. 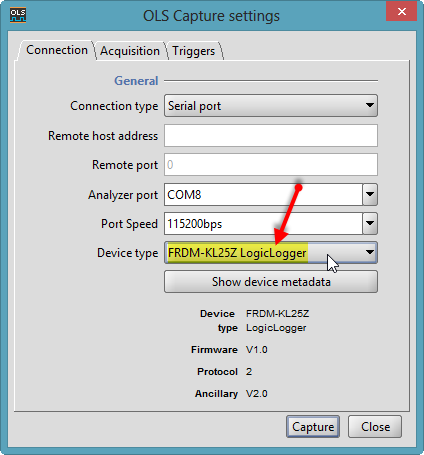 And found an new Configuration item: device.dividerClockspeed must add into the ols.profile-FRDM-KL25ZLogicLogger.cfg. Then I can see the correct device. Maybe it is the root cause. Thank you so much! I have not tried it out (yet), but I believe this is really the missing link. Thanks again! Now is problem with using it. Here I intend to use my FRDM-KL25 board as an logic analyzer to capture signal from FRDM-Kl46 board. How I can do it? For example, I have program a code which set a pin in from FRDM-KL46 from high to low and toggle that pin each 1second (asume pinA). But when I use a probe which wired J1-CON 2×8 as in the picture and capture from pinA, but there is not any pulse in capture screen. Plz, guide me how to use it. Thanks! You need to connect the two boards with GND too. And as shown in the picture, I’m using the pins on PortC. Hi, I am having trouble with the above Mentioned tutorial. For me everything happens well, untill the capture. I am able to pull up the metadata from FRDM Board, and am able to connect to the board. then when i click start capturing, it hangs, the FRDM board glows the Blue color and nothing happens afterwords. What version of OLS are you using? I’m using ols-0.9.6.1, so it could be that using a later version is causing problems? I tried the sources from GitHub, and maybe I see the problem you are seeing? Have you connected D2 and D0 (see https://mcuoneclipse.com/2013/03/24/freedom-logic-analyzer-with-dma/)? Hi gsgill112, I have found a problem, and at the end I decided to refactor the DMA support in the project. I just have committed the new sources, including an S19 file, so you can try it out. I will post a blog article on this hopefully tonight. This implementation does not need to bridge the D0 and D2 lines 🙂 Let me know if this works for you.